We left the garage and our boxed-up belongings as neat and organised as we could, ready for pick-up and delivery at the end of July, when we take ownership of our new French house. Job done, we had a lovely, slow run into the nearby fields to relax, before opening a celebratory bottle to end our stay. The next morning we drove, with Nicky’s mum, back to East Midlands for our flight back to France, feeling satisfied with our flying five-day UK stop-over. Only a few hours later we arrived back as scheduled in Limoges, all very simple, with Benny patiently waiting for us in the long-stay parking. 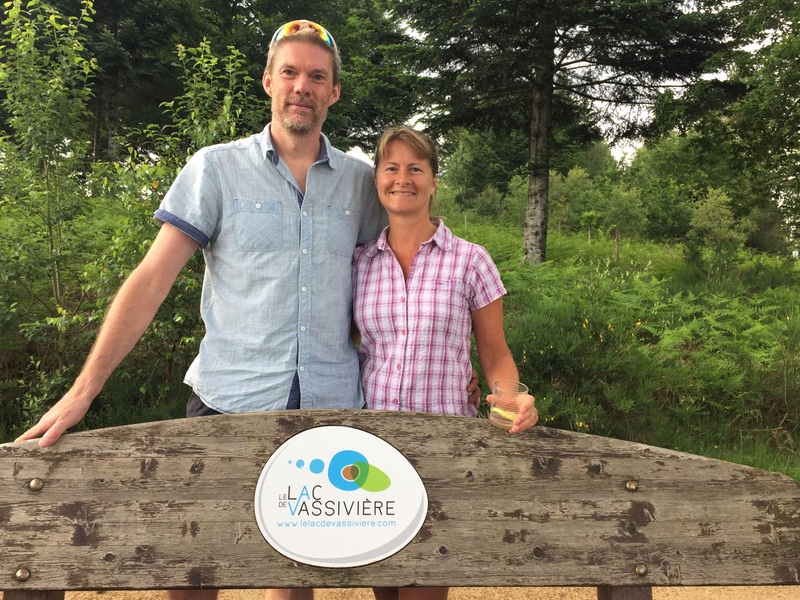 Nicky’s mum was, as organised months ago, flying out the following day from Stansted to join us for a week around Lake Vassivière, so we had no desire to move on too far. We had overnighted at several other nearby aires during our house-hunting, but never at the small municipal aire in Séreilhac, only 15 minutes from the airport, so that became our plan for this evening. We were the only van in residence, and settled comfortably into a sunny corner. 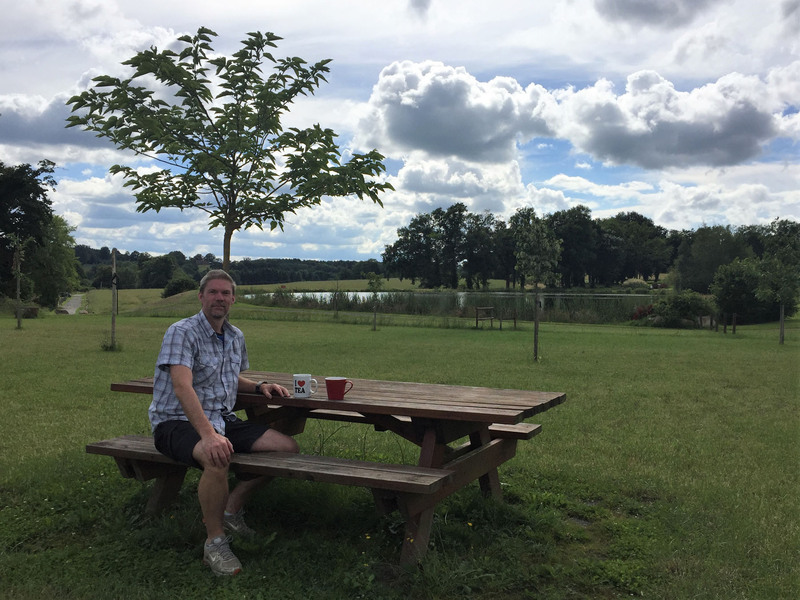 We had a cup of tea sat at a grassy picnic table and after enjoyed a short walk around the nearby lake; it was such peaceful place, a little haven, yet so close to the city and the main north-south road through the park. A lazy morning and big food and drink shopping trip followed, before arriving back at the airport early afternoon to collect Nicky’s mum. From there we doodled around Limoges and then cross-country, always heading east. We passed through Saint-Leonard-de-Noblat before stopping in Peyrat-le-Château for a brief cup of tea and to pick up the forgotten cash required for our apartment deposit. Soon after, we hugged the northern coast of the lake to reach Masgrangeas and began the long process of extricating everything we would need for the week from its place in Benny into the small rental apartment. 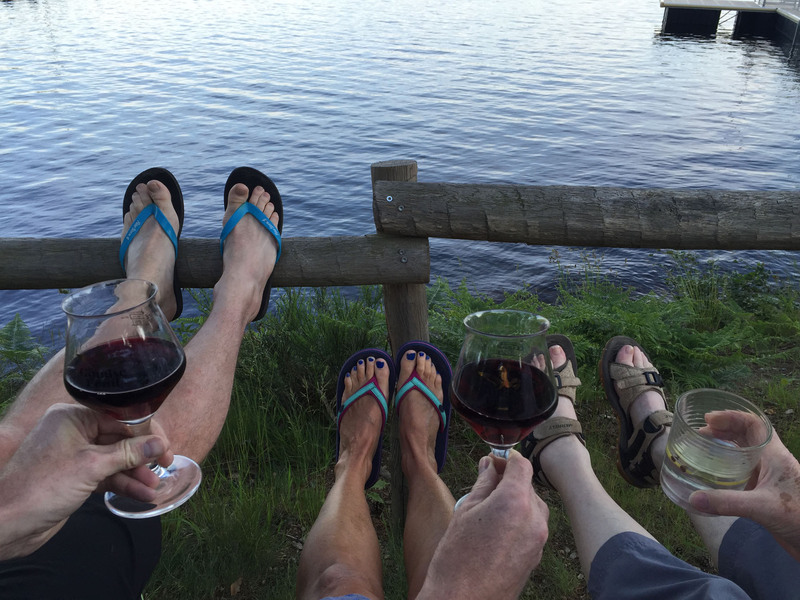 When all trips were complete we had a local explore, taking a glass with us down to the water’s edge where we sat a while and enjoyed the view. Blue skies, rolling tree-covered hills and shining, flat water; this will do us very nicely, thank you. Over the next few days we undertook a few exploratory walks and visited a few islands, some of which we would later be swimming to or running around. We rarely saw anyone else until the day of our race. We impatiently had our first swim at a small stretch of sand only a few minutes from our accommodation. 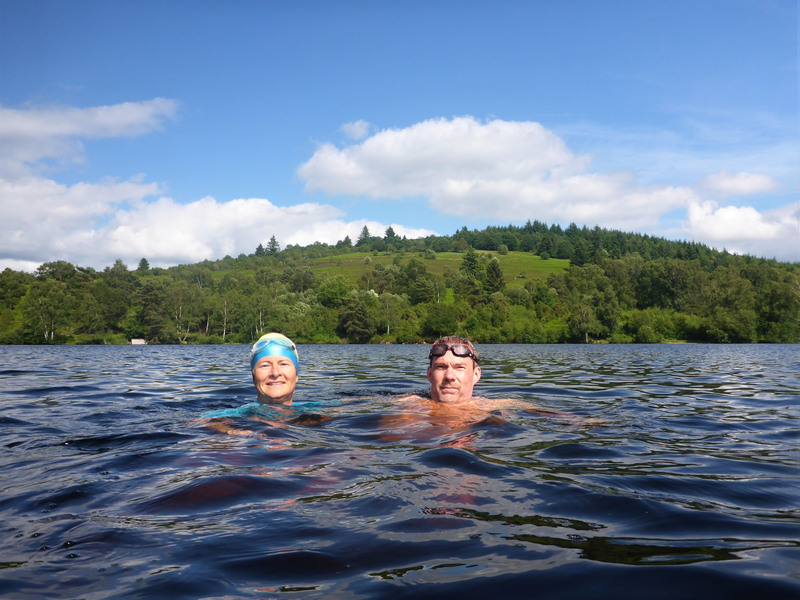 Our thermometer confirmed the water was a balmy 20 degrees, quite perfect for swimming sans wetsuit, as we were. There were warmer and cooler patches as we moved through the water, sometimes catching us by surprise by their contrast. The water had a rare silky quality, almost moisturising, feeling rather slimy on our skin when submerged but leaving us soft and smooth after drying off. The sun warmed our backs and dried us quickly, making each short dip a sensual pleasure. 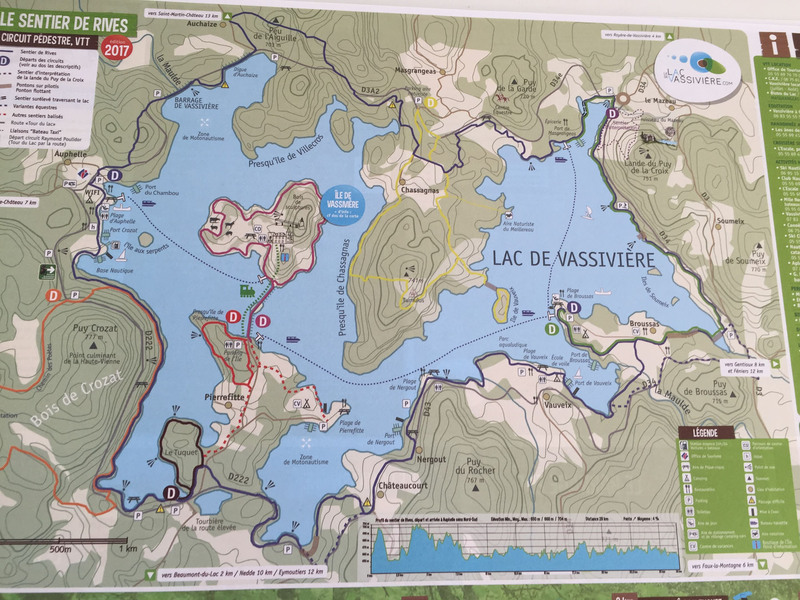 Another day we climbed a 777m hill to enjoy a panoramic overview of the lake, before dropping down to visit a small island we had spotted, linked to the mainland by a curving timber walkway. Verges of tall wavy grass were dense with white michaelmas daisies and buttercups, dotted with spears of bright purple foxgloves. Behind these, wide strips of curling ferns separated this wildflower verge from the woodland trees. Everywhere we looked the lake coastline was simply intoxicating. 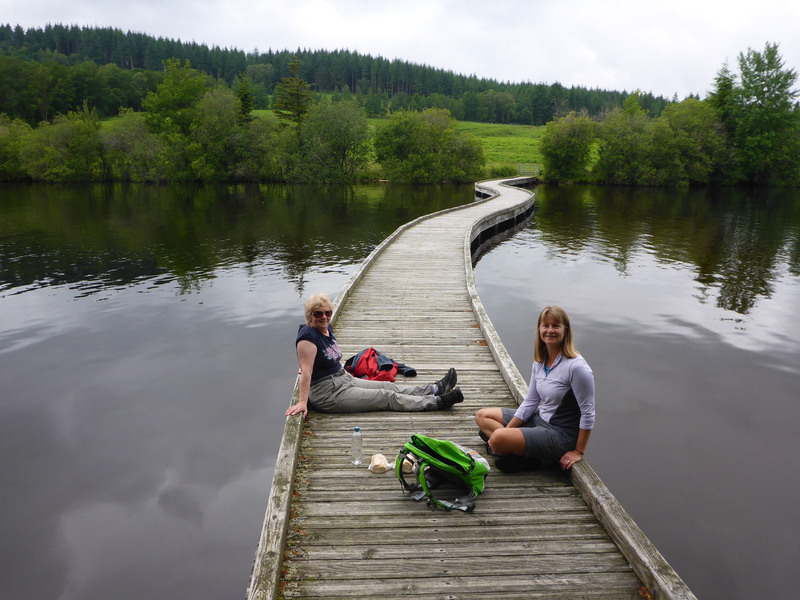 We stopped for a bite to eat on a snaking timber walkway before deciding that even though we hadn’t planned to swim, we had to strip off and slip into the inviting waters for a post-lunch skinny dip. 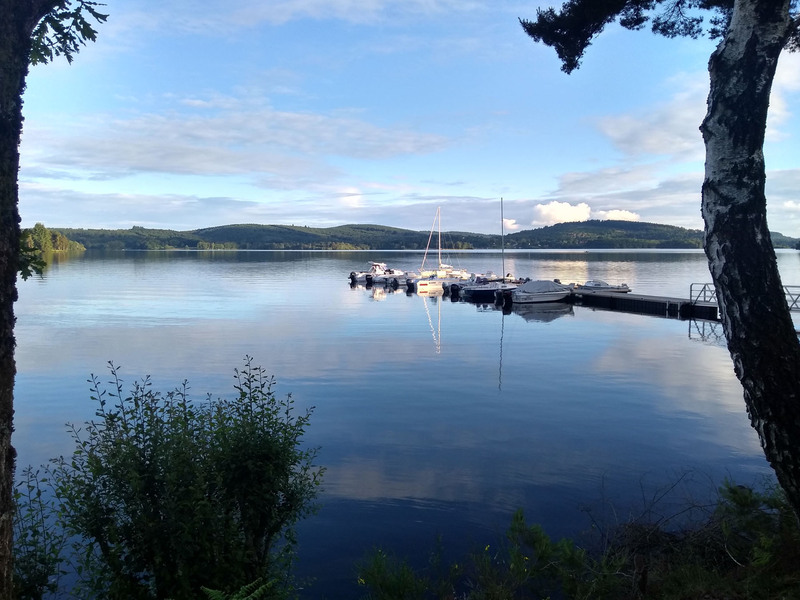 Refreshed and invigorated, we walked back along the coastline of the lake remembering our treasured memories of spontaneous swim dips in various Swedish lakes the previous summer. 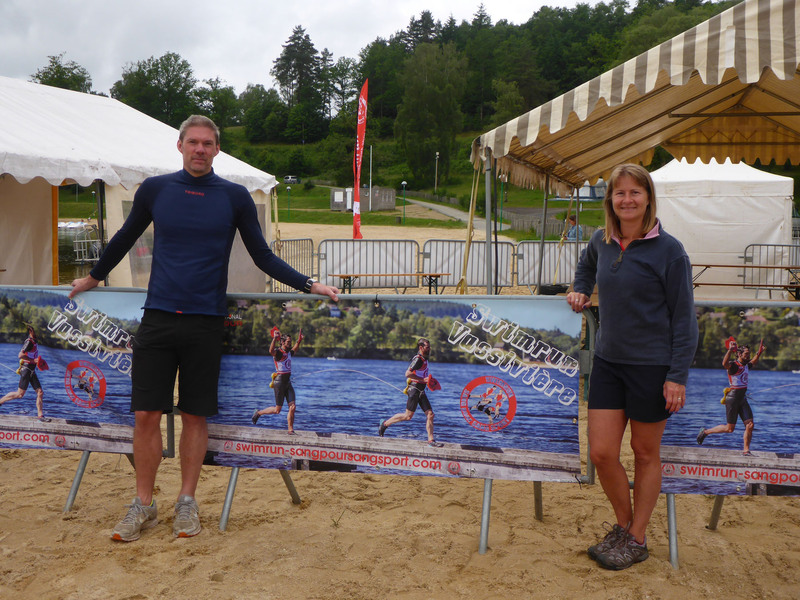 One of many 2018 challenges we set for ourselves was to undertake a SwimRun. This is now a recognised formal discipline originally borne from competitive Swedish guys challenging each other to race, via many islands, across an archipelago. It has evolved into a team event with pairs who race the course never more than 10 metres away from each other. 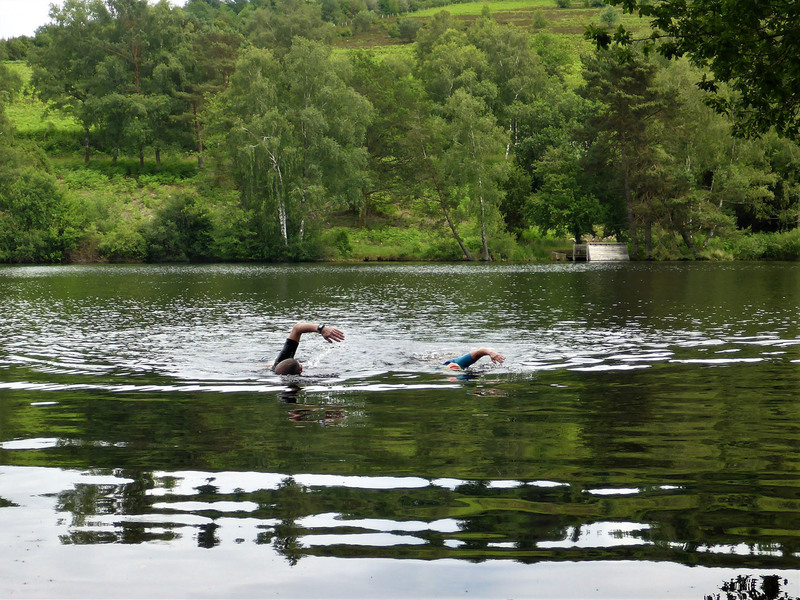 As this was our first foray into Swim Run we decided to keep it simple. 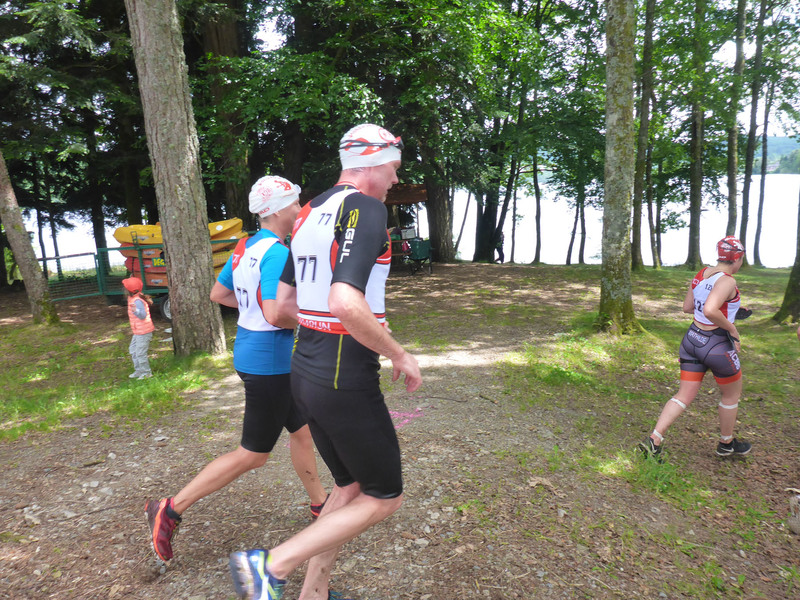 We chose the Short Course event, to keep the distance within our comfort zone. We had about 10km to go, roughly 8.5k running and 1.5k lake swimming. This meant no stress for us, meaning we could relax and enjoy both the event and the wonderful scenery, and that spectating for Nicky’s mum would not be a long day. It also gives us a base platform to later build on, so we could step up and improve and push our performance should we wish to continue entering future races. On the day of the race we parked easily at Auphelle, before transferring to the start by bus. There were a few competitors lining up looking very hot in full wetsuits, but also others wearing only speedos, trainers and the compulsory race bibs. Many had customised leg-floats and large swim-paddles at the ready. A few ingenious runners had small floats laced securely into the tops of their shoes, for additional buoyancy. We had decided we didn’t require floats, but Nicky had chosen to use swim-paddles to better match our swimming paces for our chosen combination of clothing. 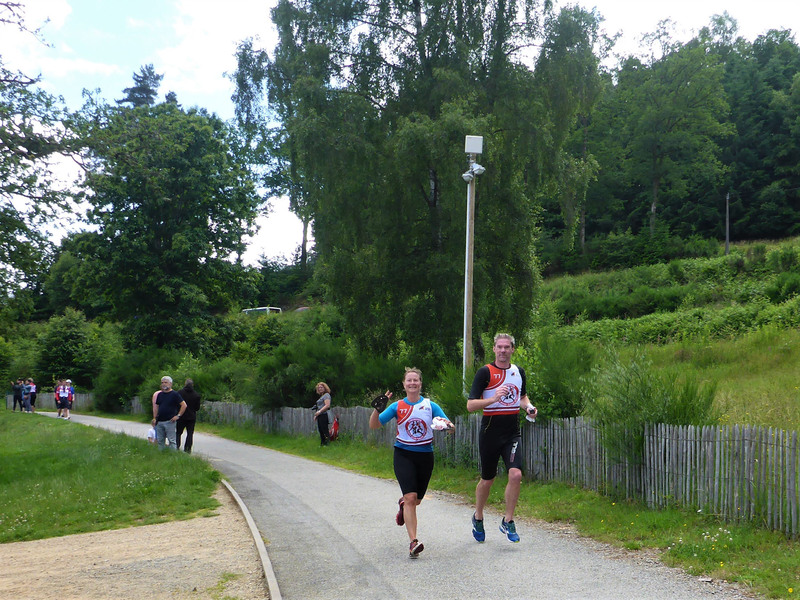 We wore 2mm thick neoprene shorts with rash vests under our bibs, enough to offer adequate warmth and some additional buoyancy but nothing that would inhibit us or make us overheat on the run sections. 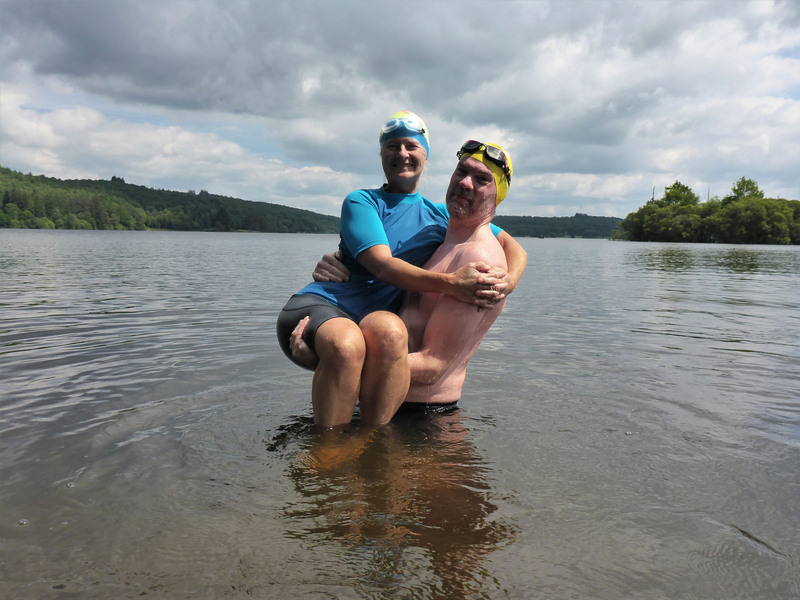 We had done some decent training over recent months, including more recently at our Ribérac housesit, where at nearby Jemaye Lake we were able to experiment with transitioning between swimming and running and try various clothing options, so we felt like we were suitably prepared. There was a great friendly atmosphere throughout the day, collaborative and supportive, not at all combative, even at the elite level. People chatted and offered tips and were ready with a helping hand if required. With a mass start, we ran 2k first, before entering the beautifully clear, warm waters, fully supported by kayaks and small power boats. 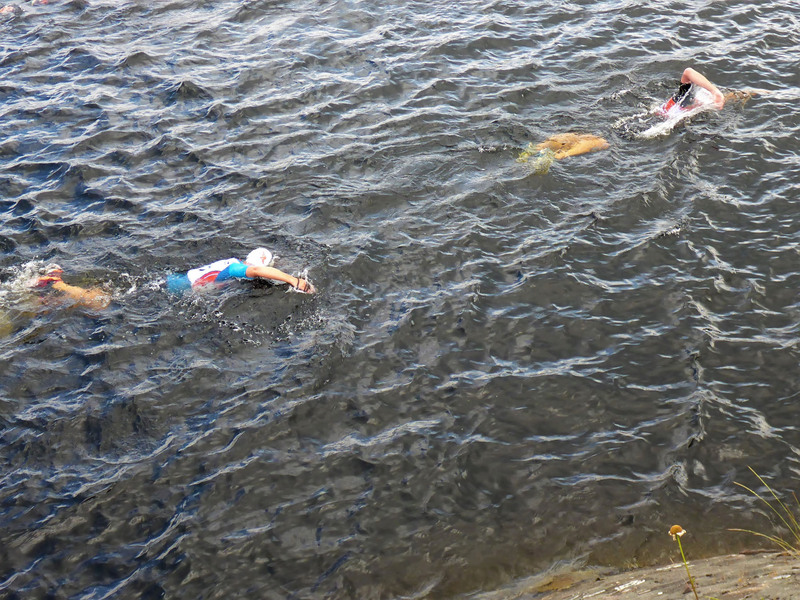 Our swim routes were marked by easily-spotted red buoys, our runs on wooded trails with a cushioning pine needle floor. 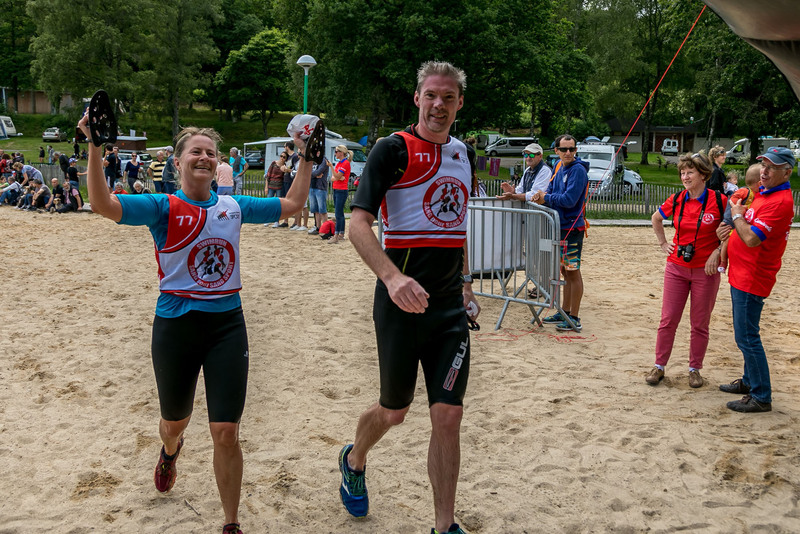 We soon found ourselves surrounded by similar-paced teams and experienced an ebb and flow as we passed them on the runs and they passed us on swims. We were 66th team home, in 1hr 33 minutes, satisfyingly faster than our pre-race estimates. We enjoyed the vocal support and a friendly atmosphere throughout. It was well marshalled and we were impressed to be handed beers and lots of great snacks at the end. 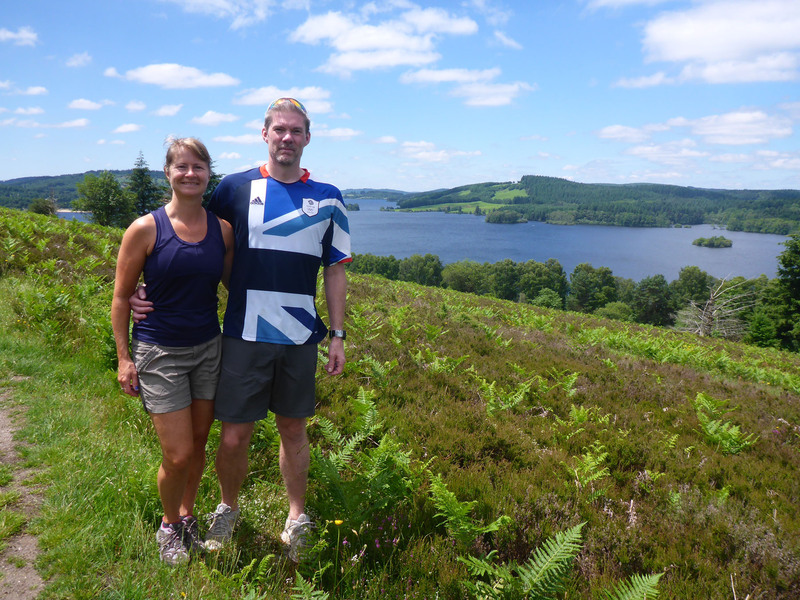 We really enjoyed the challenge and now want to do more, especially in areas with similarly impressive scenery. The following day, after a long lie-in, we decided to visit a small peninsula opposite where we were staying, to spectate and offer support to competitors in the long course event. 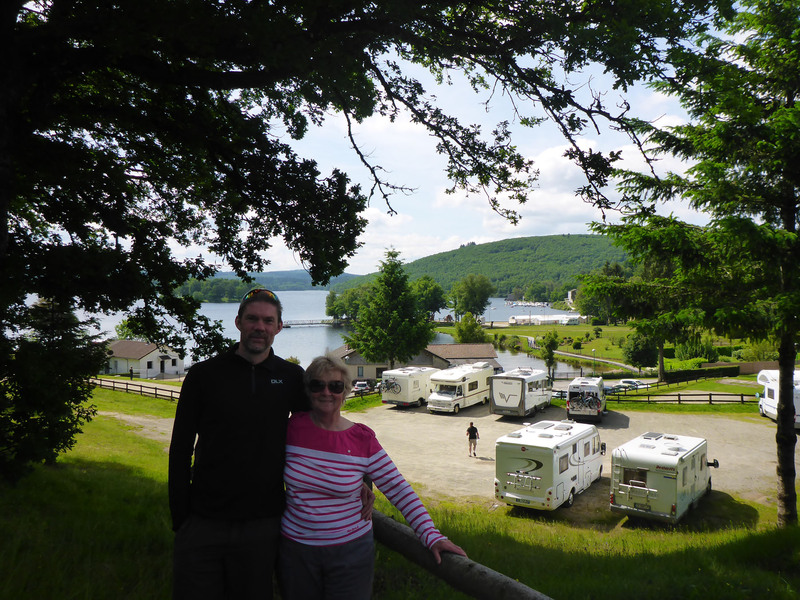 We parked at a large, flat motorhome area and walked to where the passing runners would pause to re-enter the water. We set up camping chairs and cheered the lead teams as they passed, appreciating their efforts. Later we walked up a steep hill to take in a higher vista of the lake, spotting islands, paths and beaches where we had swam or ran previously. 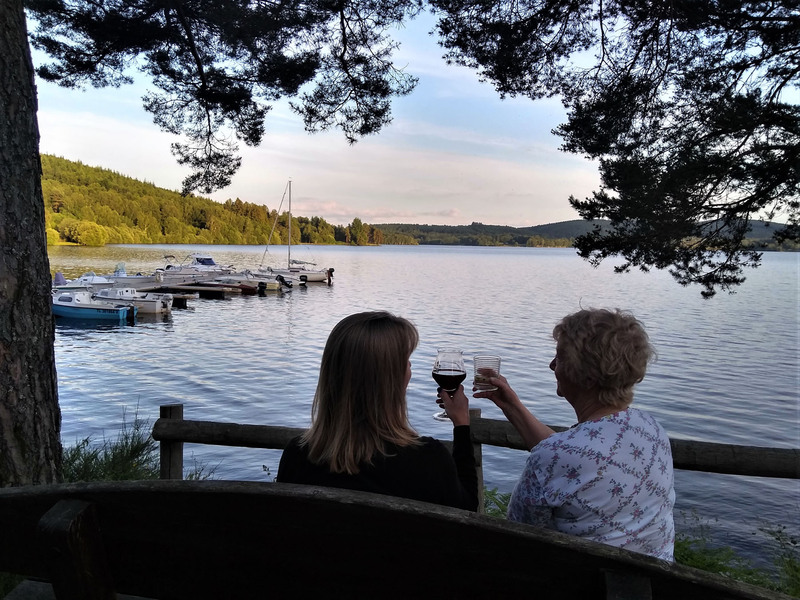 Each night the stillness of the lake drew us back to its shores, the evening light quality providing an enchanting scene of exceptional tranquillity and beauty. The surrounding hills were sometimes lit with patches of vibrant lime-greens where the setting sun caught them just right, their bright reflections mirrored on the glassy surface of the lake. We greedily soaked up the sights and sounds, revelling in the humble, accessible pleasures of such an unspoilt facility, simply perfect for swimming, running, hiking, kayaking, fishing or sailing, over and above the intoxicating natural beauty. And best of all, it sits only ninety minutes or so from our new house – ensuring that we’ll definitely be back. 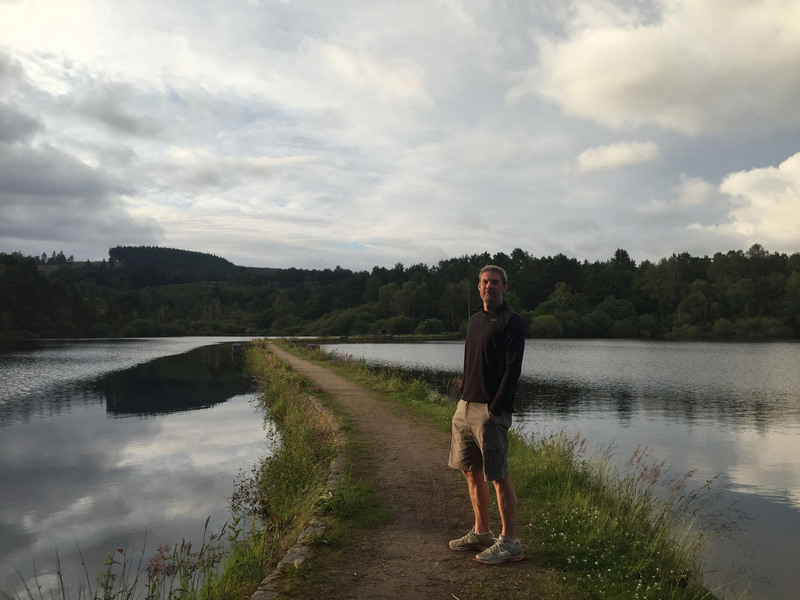 This entry was posted in 2018 Summer Tour, France, Hiking, In France, Our Travel Journal, Swimming and tagged beach, beer, camping, culture, event, lake, lake swim, nature, swim, Swimming, swimrun, walking on Jun 29, 2018 by Aaron Hill.